Though there are nearly 110 varieties of tulips, we are accustomed to the colors and shape of the Holland tulip, most often seen during the spring months. They are grown in gardens, used as potted plants, or as fresh-cut flowers. Tulips grow best in climates with long, cool springs and early summers, but are often grown as spring blooming annual plantings in warmer areas of the world. The tulip is most often associated in origin with the Netherlands, but it actually derived from the Arabic parts of the Mediterranean and North Africa. Much like the rose, the meaning of a tulip varies depending on the color of the bud. The general tulip is a symbol of love. Red tulips are often seen as a declaration of ones love to the receiver. During the Victorian era, when the language of flowers was at its peak in popularity, one could answer the giver by taking the tulip with his or her right or left hand – the right hand accepted the romantic gesture while the left hand declined it. The yellow tulip is meant to compliment the receiver by letting them know that he or she brings joy into your life. Tulips are stunning when displayed on their own or paired with a variety of other fresh flowers. They are the perfect gift to celebrate birthdays, congratulations, new baby, or send to family and friends. Besides the dahlia, tulips come in more colors than any other flower. Consider Carithers Flowers Delightful Dream Bouquet . The sophisticated design of this arrangement articulates the fresh beauty of the spring season with each vibrant petal. Beautiful bunches of pink tulips, pink roses and blush hydrangea are artfully arranged in a clear glass cylinder vase lined with lush tropical leaves to create a most impressive display of Spring’s most glorious blooms. To maximize the life of your cut tulip arrangement, immediately cut the stems under running water (to prevent air intake) and continue to re-cut an inch from the flower stems every few days. 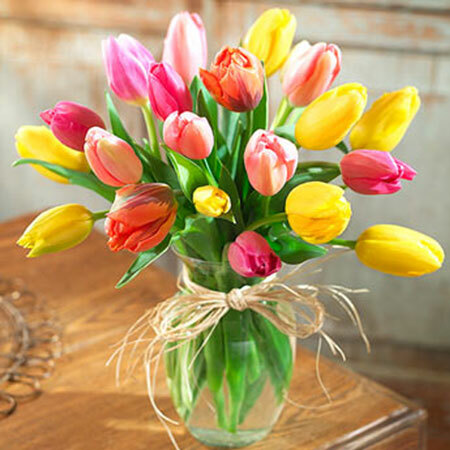 Keeping fresh water in a vase will also help breath life into your tulips.